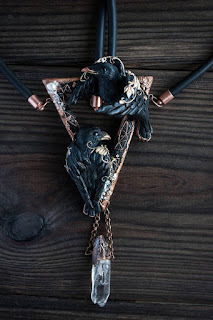 This necklace is made entirely by hand by using polymer clay and copperplating techniques. When creating fragile form I tempt to use copperplating technique to make sure that the whole construction is very sturdy. Metal also adds a valuable weight to the piece. 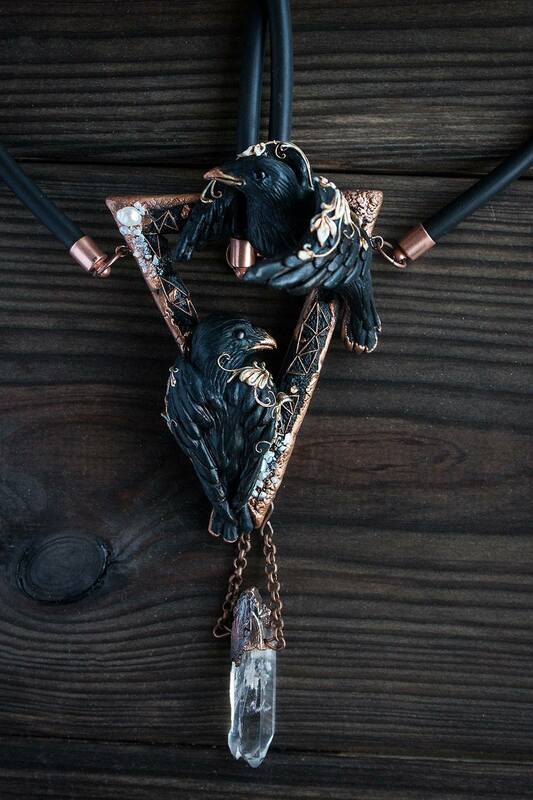 Mixed textures and techniques make this necklace more attractive and magical. Sacred Geometry, magical triangles, grotesque baroque curls, all these different elements are harmoniously united in one piece of art and two black crows are basking in all this beauty as the main characters in this composition. Polymer, copper, fine gold and copper pigments, copper accessories, copper chain, glass, pearls , rhinestone.